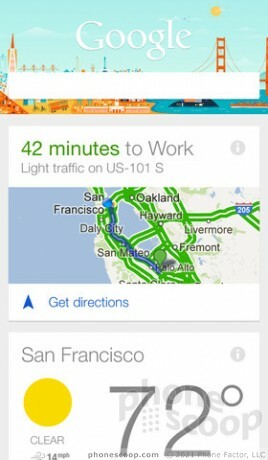 Google today added its Google Now service to the Google Search application for the iPhone and iPad. In order to use Google Now, iOS device owners will need to download and install the newest version of Google Search. Users can then sign into their Google account and activate Google Now, which offers personalized information, such as local weather, sports scores, and the time it will take to commute home, in a card-like format on the screen. Google Search with Google Now is free to download from the iTunes App Store. I signed into my Google and now the GPS arrow is always on. And under location services it's highlighted purple next to Google. Turned it off and the icon went away. I would think this would be a battery drain issue if Google Now is always using your GPS location. I'm not even sure what they mean by this, but this is not for me. Unless it is presented to me in some pie-related format, like a pie chart, pie graph, or etched into an actual pie itself, I am not interested. I might get an iPhone now. I hate Siri's robotic voice.